We get news every day of remarkable developments in the tech world that claim to make our lives better, easier, or more organized. For families and friends caring at home for ill or frail adults, innovations in health technology promise dramatic changes in the ways health care is delivered. In addition to these innovations, caregivers have some broader concerns: patient safety and security, organizing 24-hour care at home, managing complex medication protocols, meals, transportation and more. The good news is that many of these tasks can — with an investment in learning and sometimes in a new device — be made easier or more efficient. For caregivers who live far away or who are juggling jobs and care, incorporating certain new technologies into their lives can be particularly helpful and reassuring. The question is, how do you choose the most appropriate app or website or hardware to make your already complicated life easier and not more complex — or worse, add to your frustration and the time demands of providing care to someone else? Below is a brief overview of ways technology can assist caregiving families. In summarizing these options, we’re making the assumption that most of our readers have access to a computer or tablet and/or a smartphone. The goal in using any of these technologies is to find digital products and services that are practical, simple to learn and use, keep all information secure, and, ideally, are free or low-cost. As we mentioned, digital health care is a quickly growing field. But one of the most straightforward — and valuable — tech developments is the ability to email physicians with questions or symptom reports and receive a response. Your health care practitioner must, of course, be willing to allow this and other innovations, like telemedicine. Telemedicine — This is an exciting area where video or messaging technologies allow doctors to communicate with and even diagnose patients, but patients don’t have to leave home. The time-saving elements are clear — not to mention avoiding the difficulties of dressing, transporting and guiding someone to and from what may only be a 10-minute medical appointment. Chronic care — Digital tools and wearable technology (e.g., watches with sensors) can help in the care of chronic conditions by monitoring symptoms — both for your own benefit and to communicate with your doctor. Apps are available, for example, to monitor blood glucose, blood pressure and other health indicators. Health records — Emergency contacts, information on health care and insurance providers, records of over-the-counter medications, prescription history, allergies, health history, medical events, and lab tests can all be kept in one place. There are charts to record blood pressure, blood sugar, cholesterol, heart rate, body temperature, weight, pain level, etc. Some sites or apps include a journal to record daily entries about diet and physical activity. Example: HealthVault. Medication management — If used correctly, these devices can help reduce medication errors, a frequent cause of health problems, hospital admissions and emergencies. Alarms can remind users when to take medications, or pill boxes can be locked until the appropriate time. They can send messages telling users which medication to take and when, track missed doses, and provide voice description of a medication and how it should be taken. For someone with multiple medications or who has memory problems from stroke or Alzheimer’s, these devices can be helpful as long as the person understands — and can remember — how they are to be used. The physical safety and well-being of loved ones is an enormous concern for caregivers. Technology can be helpful in a number of ways to monitor the safety of someone at home, even if you’re not there. Fall prevention and response — Every year, one in three adults age 65 and older will fall. Falls are the most common cause of death due to injury in this age group. Some health conditions increase the likelihood of a fall: problems with walking or moving around, medications, foot problems or unsafe footwear, drop in blood pressure when moving from sitting to standing, vision problems and tripping hazards at home. Help is available with fall detectors/sensors, sensor pads and wheelchair alarms. Many people benefit from emergency response systems such as Lifeline, Vital Link and Life Alert. Motion detectors — These devices can be as simple as a light turning on when someone enters a room. More complex devices can monitor for activity in a particular area or room of the house. You can arrange to be notified if there has been no activity for a given period of time. Webcams — Another type of motion detector in which cameras are set up in different places in the house. You view the webcam to see what someone is doing, e.g., sleeping, watching TV, eating. With some of these devices, keep in mind that privacy issues may need to be addressed. Audio Monitors — Two-way communication devices, such as baby monitors, allow you to listen to someone from another room, so you can hear if your parent has awakened from sleep, for example, or is ready for a meal, or needs help getting out of bed. Wandering/exit-seeking — Door alarms can keep someone from wandering outside. GPS devices can be programmed and personalized, enabling caregivers to link a smartphone to a mobile device installed in a shoe or belt, helping to locate someone if he or she wanders or becomes lost due to severe memory loss. Telephone/video check-ins — Available in many communities, volunteers make daily calls to older adults who live alone to be sure they can answer the phone and are OK. Video chatting, using Skype or a similar service, helps you connect with someone if you can’t be there in person. Communication aids: Specialized equipment, such as phones with large buttons and enhanced audio, or computers with greatly enlarged type, can help someone with impaired vision or hearing. Shopping — Even if your care responsibilities only involve shopping or banking/bill-paying for your parent, you’ll save time if you can do it from home. Online prescription refills are also helpful, if that service is available to you. Several websites carry specialized clothing, medical equipment, assistive devices, incontinence supplies and more. E-Calendars — are accessible anywhere via desktop or mobile devices, can alert you to upcoming events or tasks, and are often able to be shared among family members, friends, aides and others who may be involved in care activities. Information-sharing sites — allow you to share updates and photos with invited family members and friends who can view and add comments. They also allow you to give permission to someone else to post updates on your behalf, taking this responsibility off of your shoulders. Exercise — Care demands often prevent family caregivers from getting enough exercise or sleep, yet these are necessary to stay healthy, both physically and mentally. Several different sites can remind you to exercise, help you track the exercise you’re already doing, and connect with others for support or instruction. Example: American Heart Association’s Online Activity Tracker; online exercise videos through YouTube or Netflix. Entertainment — in addition to an enormous number of games and brain exercises, you can find free movies, music from all eras, old radio programs and other online ways to pass the time and perhaps prompt conversation and engagement with your loved one. New innovations in technology that can be used in the home are announced every day. Sometimes, however, there seems to be a disconnect between what is offered and what caregivers really need or want. In other instances, a too-steep learning curve makes adoption of programs and apps challenging. Search online to read about the kinds of tools you’re interested in before you purchase anything. Ask friends what websites or apps they find particularly useful. Visit a store where they sell electronic devices such as smartphones. Ask a salesperson to guide you in testing the tool. Find out what type of follow-up help and free training they offer. Try to find a tech-wise family member, friend, service (or local teenager!) to provide assistance should you need it. Residential Care Search: Online listings by geographic area. This extensive federally funded database lists products for people with disabilities. Developed for long-term care facilities, this site offers information on tools that can help in any setting. 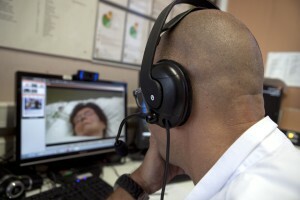 Left: Technology is increasingly allowing doctors to communicate with and even diagnose patients who are unable to travel for regular check-ups. Photo by BSIP/UIG via Getty Images.